Golden Multimedia specializes in serving educational institutions, non-profit organizations and small businesses who deserve outstanding interactive design work. Ideum specializes in providing media services to museums, educational institutions, nonprofit organizations, and socially responsible companies. They have a wide range of experience, expertise and backgrounds in visual and graphic design, multimedia, programming, writing and education. Earth, Moon, Mars, and Beyond features NASA’s major initiatives of exploration and science. Ideum worked closely with NASA’s Office of Public Affairs to design and develop this project. 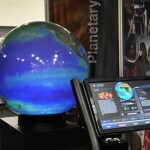 The exhibit runs on a touch-screen display and it powers a second Global Imagination Magic Planet™ Display which shows spherical images and plays animations of the Earth, the Moon, and other planets and moons. NASA uses the Earth, Moon, Mars, and Beyond exhibit for air shows, conferences and other events. The exhibit was developed in Macromedia Flash. Ideum devised an external content structure allowing NASA personnel to easily update exhibit information. To read more about this project, please go to www.ideum.com. Global Visons and Engine Room create a powerful team to bring stories to life on the Magic Planet. Global Visions has a reputation for international production and has put camera crews in more than 30 countries. They have an understanding of global issues and have interviewed a variety of high profile personalities. Engine Room is post production with attitude, creativity and expertise. They have demonstrated the ability to make images dance on the Magic Planet while not losing site of the story to be told. Creating stories with impact is the unique synergy of this dynamic team. NanE Design Corp. Ltd. is led by a team of professional veterans in the virtual reality (VR) industry. The team members are specialized in several different fields including the design, planning and construction of museum displays, children’s vocational experience facilities, 3D/4D theaters, motion freedom simulation platforms and the production of interactive multi-media content. NanE’s customers range from museums and theme parks to exhibition halls all across Taiwan. NanE has recently begun seeding their business in China, marking another milestone in the history of successful development. tukom – unser Logo – ist die Kurzform von Telemetrie und Kommunikation GmbH. Die Luft- und Raumfahrtindustrie, die Verteidigungsindustrie sowie Regierungsorganisationen beziehen von uns technische Produkte, Dienstleistungen und Komplettlösungen für Telemetrie- und Kommunikationsaufgaben. In diesem Umfeld fühlen wir uns zu Hause. Mehr als 40 Jahre Erfahrung in der Beschaffung, dem Vertrieb und der Anwendung von komplexen technischen Systemen sind die Basis für eine zielorientierte und umfassende Beratung. Sogar über das umseitig aufgeführte Portfolio hinaus können Sie punktgenaue Problemlösungen von uns erwarten. Die Hersteller, die wir repräsentieren, kommen aus der EU und den USA und gehören zu den renommiertesten Unternehmen in ihrem jeweiligen Bereich. BVK interaktif egitim teknolojileri sunmaktadır. Gelecegin bilimadamlarinin yetistirilmesine ilham veren ve ogrencilerin pozitif bilimlere olan ilgilerini, meraklarını arttiran Sihirli Kure ile eğitime yepyeni bir bakis sunmakta olan BVK, egitim kurumlarinin stratejik isortagi olmayi hedeflemektedir. Egitim sektoru yanisira farkli pazarlama aktivitelerinde de tercih edilmekte olan Sihirli Kure’ye iliskin ozgun projeler icin bizi arayin.